Huerons is a original puzzle game, with unique gameplay, in which you have to link dots that have the same color, trough portals, black holes and other interesting things. If you can't solve Level 100 Parallel on your own, just look at the picture above to see the correct solution. 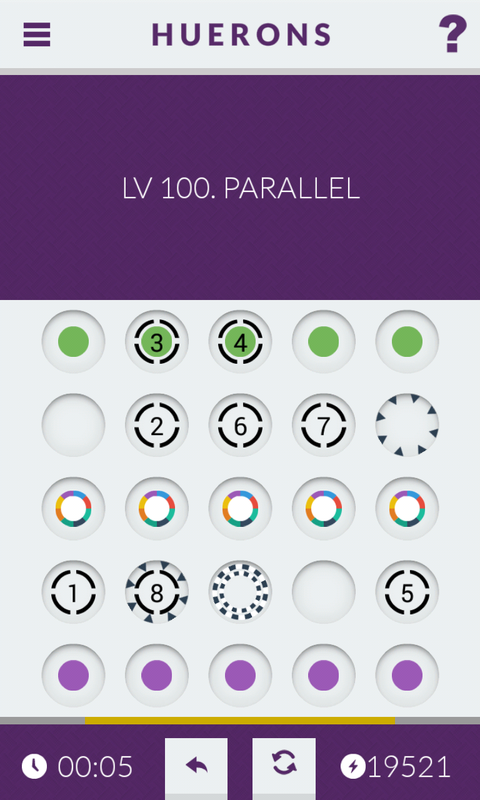 Huerons Level 100 Parallel Walkthrough, Cheats, Solution for Android, iPhone, iPad, iPod. Note: This is "Huerons" by "Bulkypix"
Huerons is a original puzzle game, with unique gameplay, in which you have to link dots that have the same color, trough portals, black holes and other interesting things. 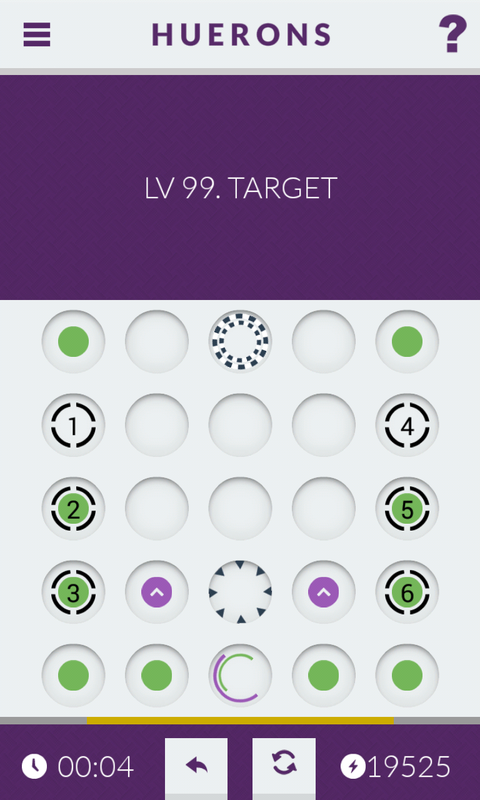 If you can't solve Level 99 Target on your own, just look at the picture above to see the correct solution. Huerons Level 99 Target Walkthrough, Cheats, Solution for Android, iPhone, iPad, iPod. Huerons is a original puzzle game, with unique gameplay, in which you have to link dots that have the same color, trough portals, black holes and other interesting things. If you can't solve Level 98 Harmony on your own, just look at the picture above to see the correct solution. 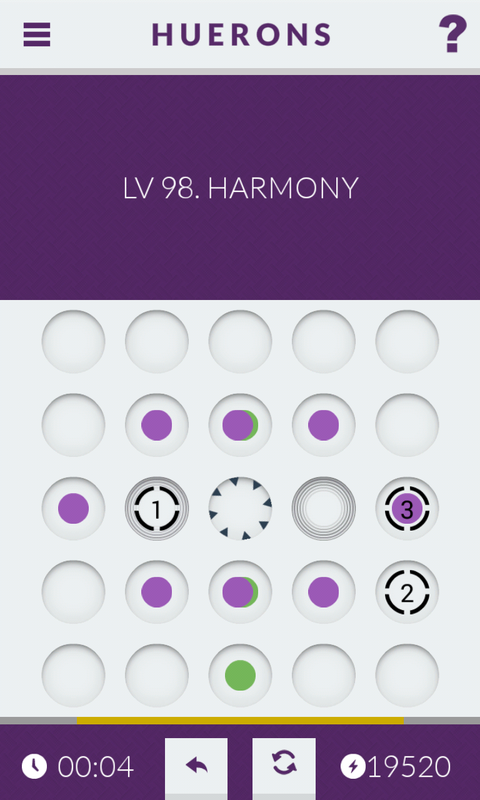 Huerons Level 98 Harmony Walkthrough, Cheats, Solution for Android, iPhone, iPad, iPod. Huerons is a original puzzle game, with unique gameplay, in which you have to link dots that have the same color, trough portals, black holes and other interesting things. If you can't solve Level 97 Midway on your own, just look at the picture above to see the correct solution. 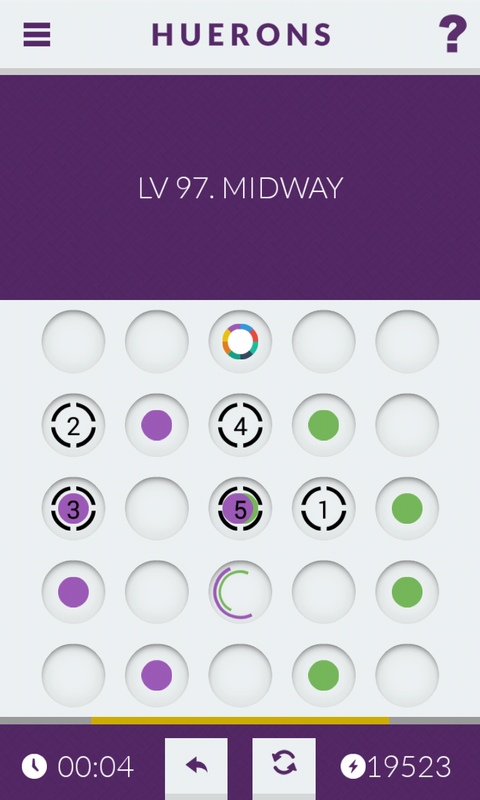 Huerons Level 97 Midway Walkthrough, Cheats, Solution for Android, iPhone, iPad, iPod. Huerons is a original puzzle game, with unique gameplay, in which you have to link dots that have the same color, trough portals, black holes and other interesting things. If you can't solve Level 96 Surrounded on your own, just look at the picture above to see the correct solution. 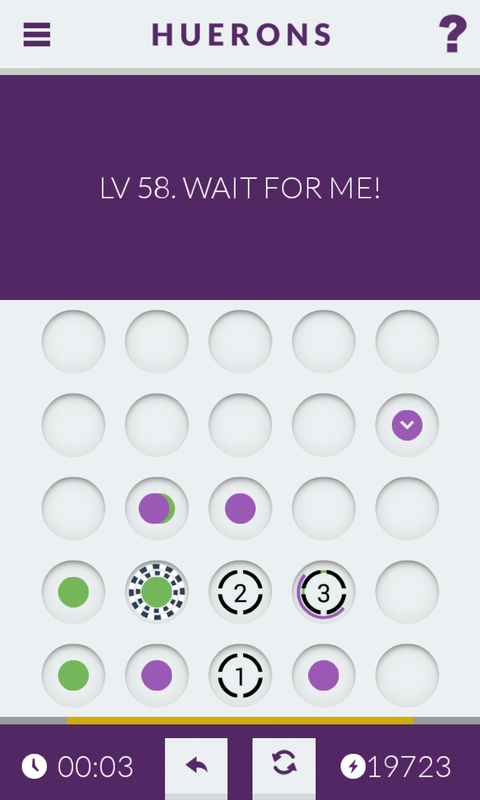 Huerons Level 96 Surrounded Walkthrough, Cheats, Solution for Android, iPhone, iPad, iPod. Huerons is a original puzzle game, with unique gameplay, in which you have to link dots that have the same color, trough portals, black holes and other interesting things. If you can't solve Level 95 Pallindrome on your own, just look at the picture above to see the correct solution. Huerons Level 95 Pallindrome Walkthrough, Cheats, Solution for Android, iPhone, iPad, iPod. Huerons is a original puzzle game, with unique gameplay, in which you have to link dots that have the same color, trough portals, black holes and other interesting things. If you can't solve Level 94 Clash on your own, just look at the picture above to see the correct solution. 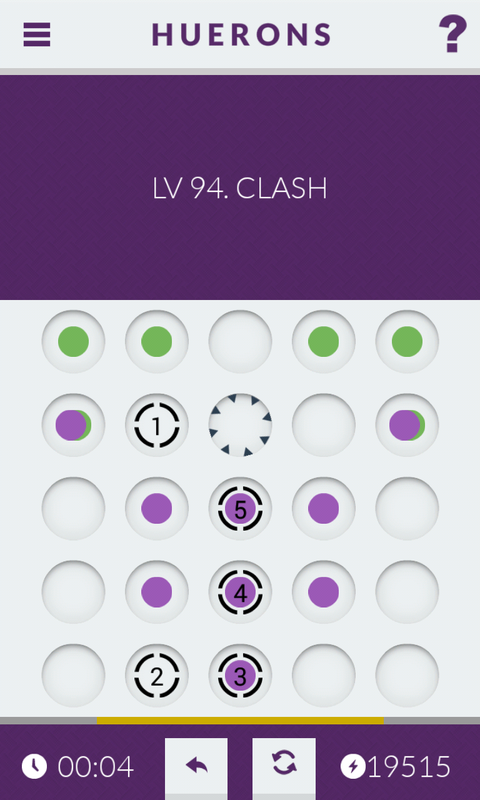 Huerons Level 94 Clash Walkthrough, Cheats, Solution for Android, iPhone, iPad, iPod. Huerons is a original puzzle game, with unique gameplay, in which you have to link dots that have the same color, trough portals, black holes and other interesting things. If you can't solve Level 93 The One on your own, just look at the picture above to see the correct solution. Huerons Level 93 The One Walkthrough, Cheats, Solution for Android, iPhone, iPad, iPod. Huerons is a original puzzle game, with unique gameplay, in which you have to link dots that have the same color, trough portals, black holes and other interesting things. If you can't solve Level 92 Perimeter on your own, just look at the picture above to see the correct solution. 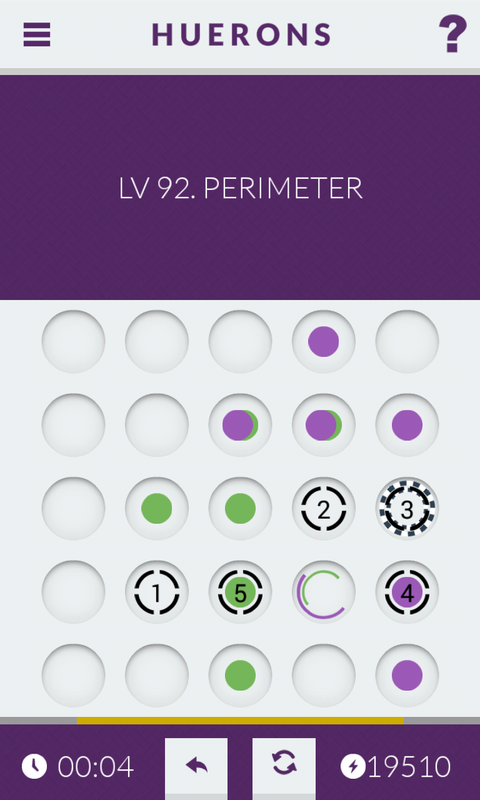 Huerons Level 92 Perimeter Walkthrough, Cheats, Solution for Android, iPhone, iPad, iPod. Huerons is a original puzzle game, with unique gameplay, in which you have to link dots that have the same color, trough portals, black holes and other interesting things. 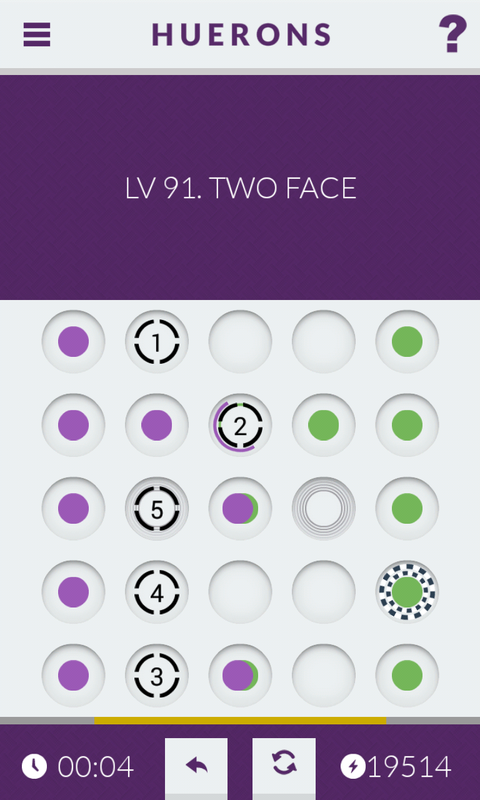 If you can't solve Level 91 Two Face on your own, just look at the picture above to see the correct solution. Huerons Level 91 Two Face Walkthrough, Cheats, Solution for Android, iPhone, iPad, iPod. Huerons is a original puzzle game, with unique gameplay, in which you have to link dots that have the same color, trough portals, black holes and other interesting things. 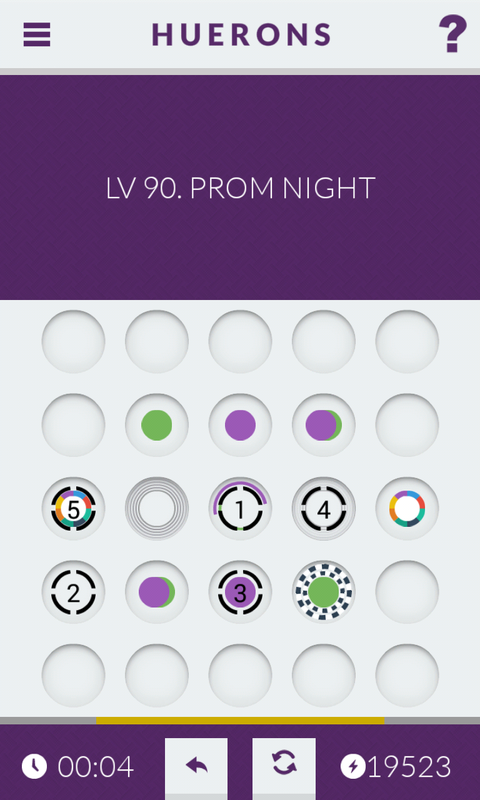 If you can't solve Level 90 Prom Night on your own, just look at the picture above to see the correct solution. Huerons Level 90 Prom Night Walkthrough, Cheats, Solution for Android, iPhone, iPad, iPod. Huerons is a original puzzle game, with unique gameplay, in which you have to link dots that have the same color, trough portals, black holes and other interesting things. If you can't solve Level 89 Head On on your own, just look at the picture above to see the correct solution. Huerons Level 89 Head On Walkthrough, Cheats, Solution for Android, iPhone, iPad, iPod. Huerons is a original puzzle game, with unique gameplay, in which you have to link dots that have the same color, trough portals, black holes and other interesting things. If you can't solve Level 88 Propulsors on your own, just look at the picture above to see the correct solution. Huerons Level 88 Propulsors Walkthrough, Cheats, Solution for Android, iPhone, iPad, iPod. Huerons is a original puzzle game, with unique gameplay, in which you have to link dots that have the same color, trough portals, black holes and other interesting things. 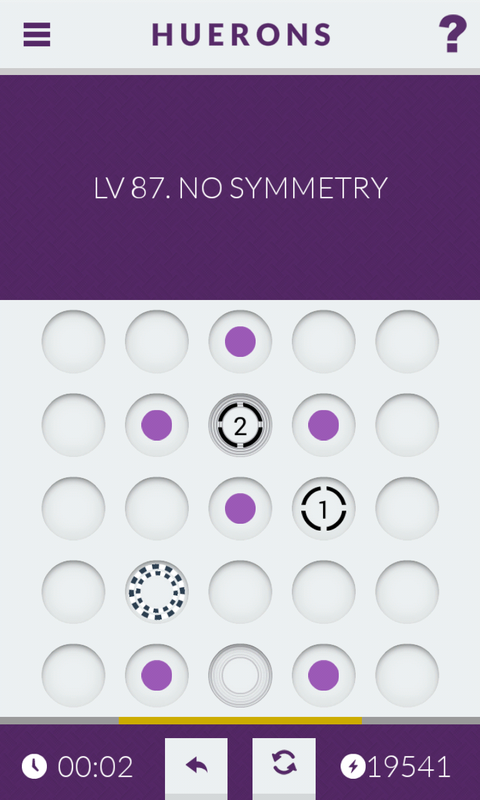 If you can't solve Level 87 No Symmetry on your own, just look at the picture above to see the correct solution. Huerons Level 87 No Symmetry Walkthrough, Cheats, Solution for Android, iPhone, iPad, iPod. Huerons is a original puzzle game, with unique gameplay, in which you have to link dots that have the same color, trough portals, black holes and other interesting things. 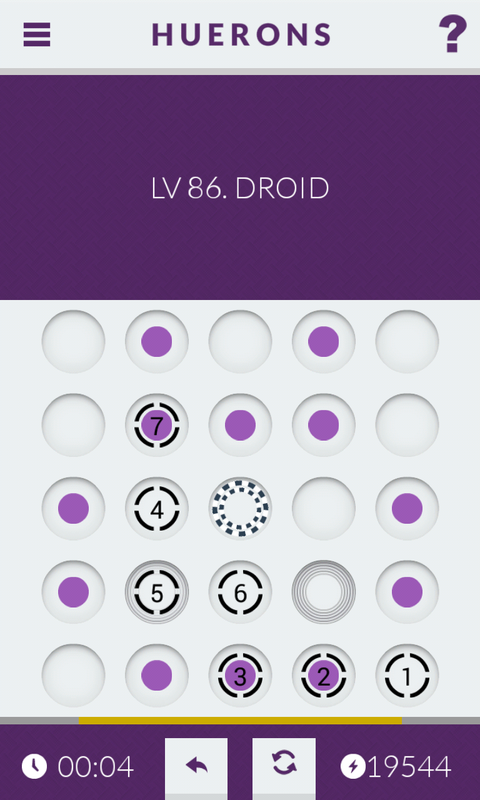 If you can't solve Level 86 Droid on your own, just look at the picture above to see the correct solution. Huerons Level 86 Droid Walkthrough, Cheats, Solution for Android, iPhone, iPad, iPod. Huerons is a original puzzle game, with unique gameplay, in which you have to link dots that have the same color, trough portals, black holes and other interesting things. 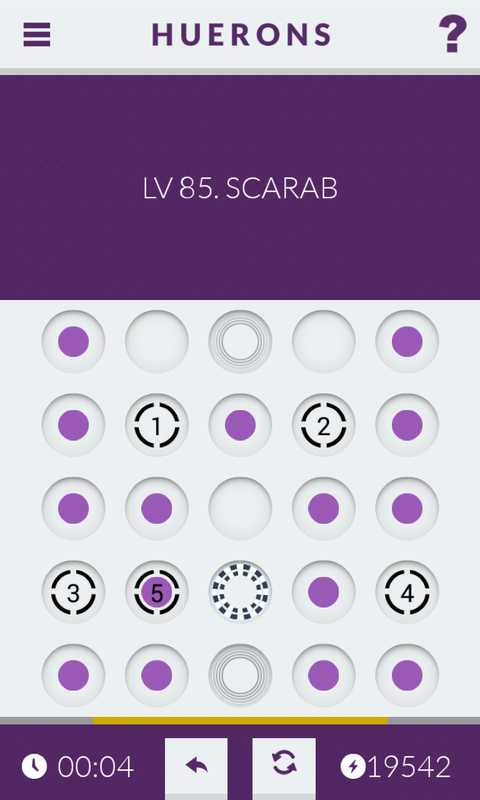 If you can't solve Level 85 Scarab on your own, just look at the picture above to see the correct solution. Huerons Level 85 Scarab Walkthrough, Cheats, Solution for Android, iPhone, iPad, iPod. Huerons is a original puzzle game, with unique gameplay, in which you have to link dots that have the same color, trough portals, black holes and other interesting things. 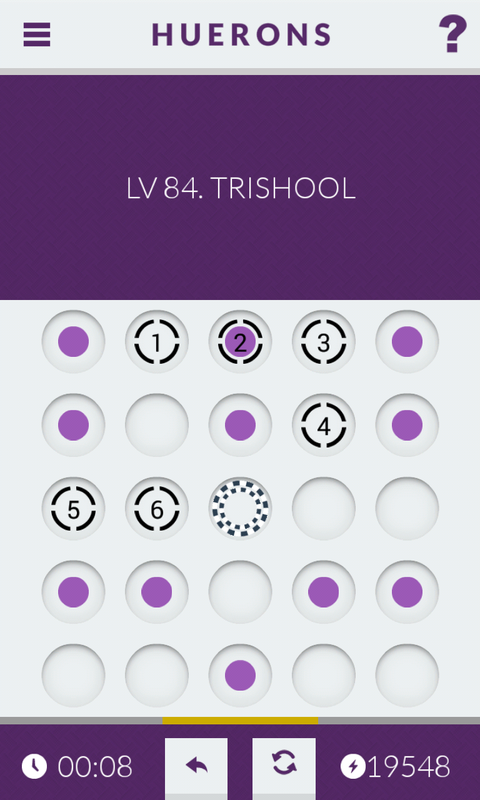 If you can't solve Level 84 Trishool on your own, just look at the picture above to see the correct solution. Huerons Level 84 Trishool Walkthrough, Cheats, Solution for Android, iPhone, iPad, iPod. Huerons is a original puzzle game, with unique gameplay, in which you have to link dots that have the same color, trough portals, black holes and other interesting things. If you can't solve Level 83 Side Step Revolutions on your own, just look at the picture above to see the correct solution. 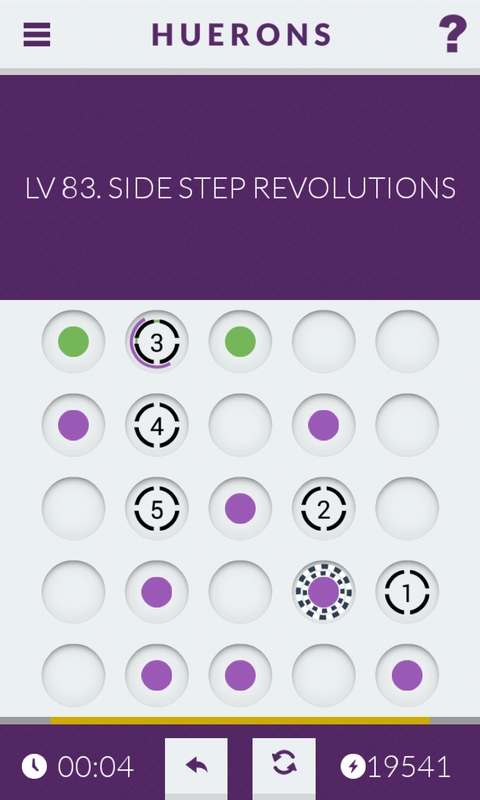 Huerons Level 83 Side Step Revolutions Walkthrough, Cheats, Solution for Android, iPhone, iPad, iPod. Huerons is a original puzzle game, with unique gameplay, in which you have to link dots that have the same color, trough portals, black holes and other interesting things. If you can't solve Level 82 Mike Tyson on your own, just look at the picture above to see the correct solution. 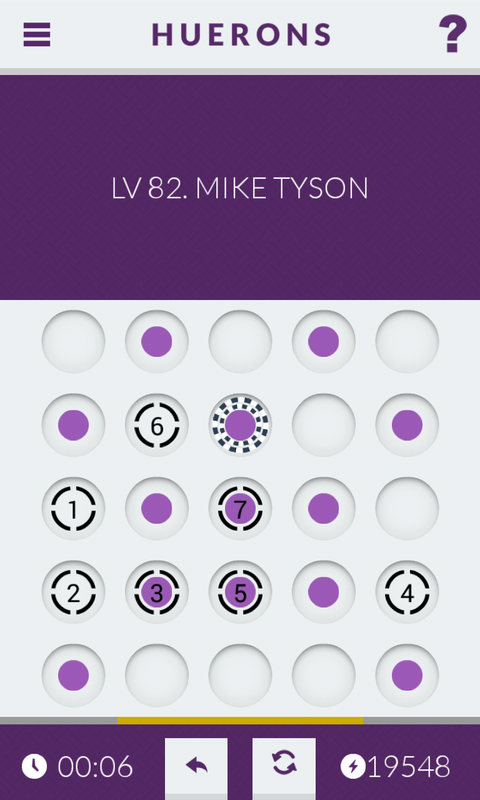 Huerons Level 82 Mike Tyson Walkthrough, Cheats, Solution for Android, iPhone, iPad, iPod. Huerons Level 81 - Wayne Enterp. Huerons is a original puzzle game, with unique gameplay, in which you have to link dots that have the same color, trough portals, black holes and other interesting things. If you can't solve Level 81 Wayne Enterp. on your own, just look at the picture above to see the correct solution. Huerons Level 81 Wayne Enterp. Walkthrough, Cheats, Solution for Android, iPhone, iPad, iPod. Huerons Level 80 - He Is The One! Huerons is a original puzzle game, with unique gameplay, in which you have to link dots that have the same color, trough portals, black holes and other interesting things. 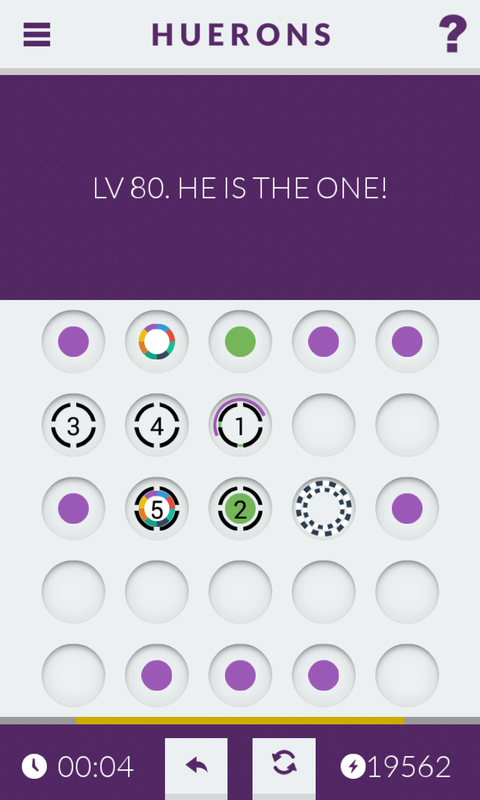 If you can't solve Level 80 He Is The One! on your own, just look at the picture above to see the correct solution. Huerons Level 80 He Is The One! Walkthrough, Cheats, Solution for Android, iPhone, iPad, iPod. Huerons is a original puzzle game, with unique gameplay, in which you have to link dots that have the same color, trough portals, black holes and other interesting things. If you can't solve Level 79 Narrow Passage on your own, just look at the picture above to see the correct solution. 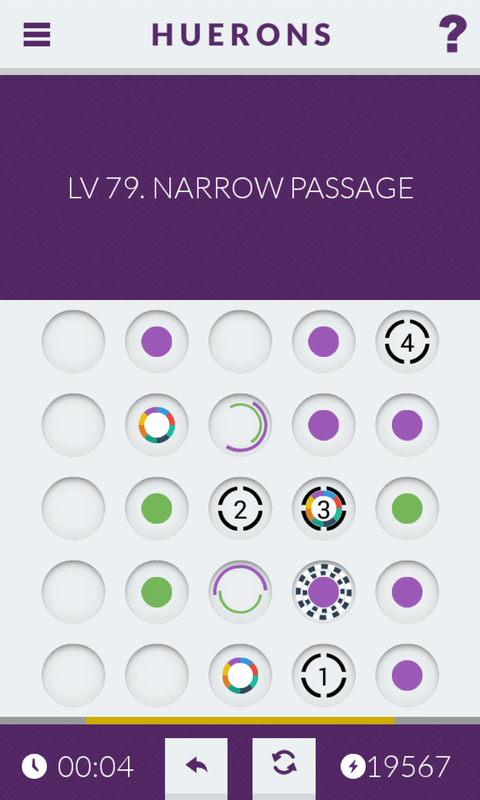 Huerons Level 79 Narrow Passage Walkthrough, Cheats, Solution for Android, iPhone, iPad, iPod. Huerons is a original puzzle game, with unique gameplay, in which you have to link dots that have the same color, trough portals, black holes and other interesting things. If you can't solve Level 78 White Mischief on your own, just look at the picture above to see the correct solution. 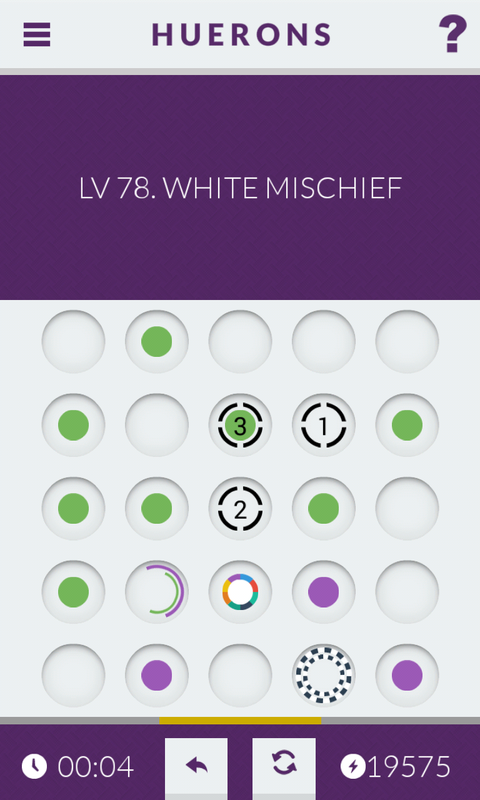 Huerons Level 78 White Mischief Walkthrough, Cheats, Solution for Android, iPhone, iPad, iPod. Huerons is a original puzzle game, with unique gameplay, in which you have to link dots that have the same color, trough portals, black holes and other interesting things. If you can't solve Level 77 Graffiti on your own, just look at the picture above to see the correct solution. 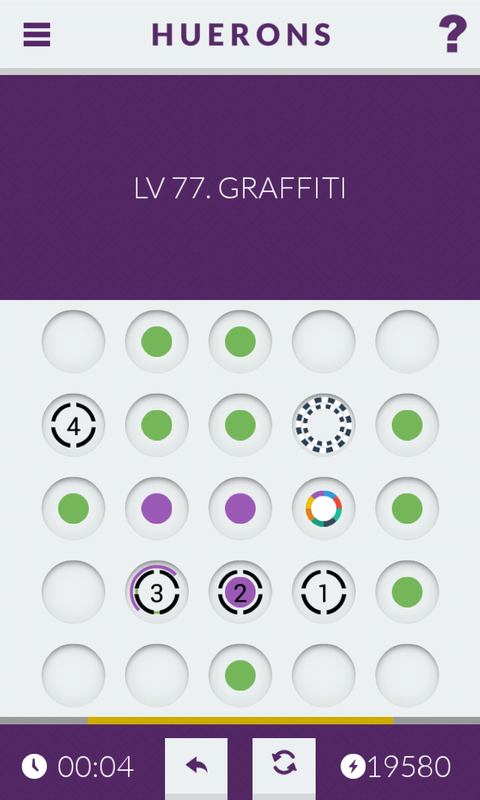 Huerons Level 77 Graffiti Walkthrough, Cheats, Solution for Android, iPhone, iPad, iPod. Huerons is a original puzzle game, with unique gameplay, in which you have to link dots that have the same color, trough portals, black holes and other interesting things. If you can't solve Level 76 The Matrix on your own, just look at the picture above to see the correct solution. 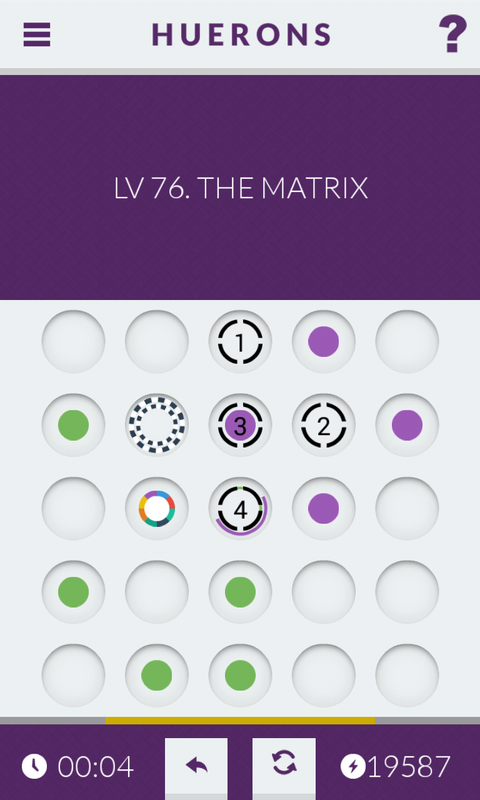 Huerons Level 76 The Matrix Walkthrough, Cheats, Solution for Android, iPhone, iPad, iPod. Huerons Level 75 - Thats Easy! Huerons is a original puzzle game, with unique gameplay, in which you have to link dots that have the same color, trough portals, black holes and other interesting things. If you can't solve Level 75 Thats Easy! on your own, just look at the picture above to see the correct solution. Huerons Level 75 Thats Easy! Walkthrough, Cheats, Solution for Android, iPhone, iPad, iPod. Huerons is a original puzzle game, with unique gameplay, in which you have to link dots that have the same color, trough portals, black holes and other interesting things. If you can't solve Level 74 Burger Bites on your own, just look at the picture above to see the correct solution. 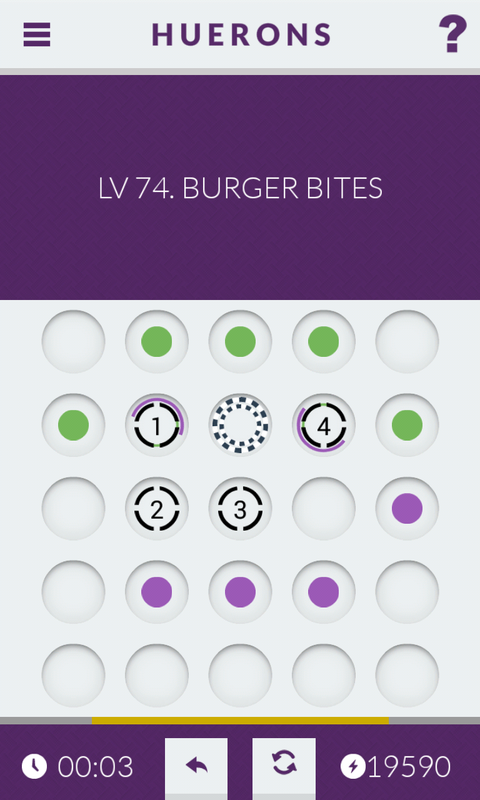 Huerons Level 74 Burger Bites Walkthrough, Cheats, Solution for Android, iPhone, iPad, iPod. Huerons is a original puzzle game, with unique gameplay, in which you have to link dots that have the same color, trough portals, black holes and other interesting things. 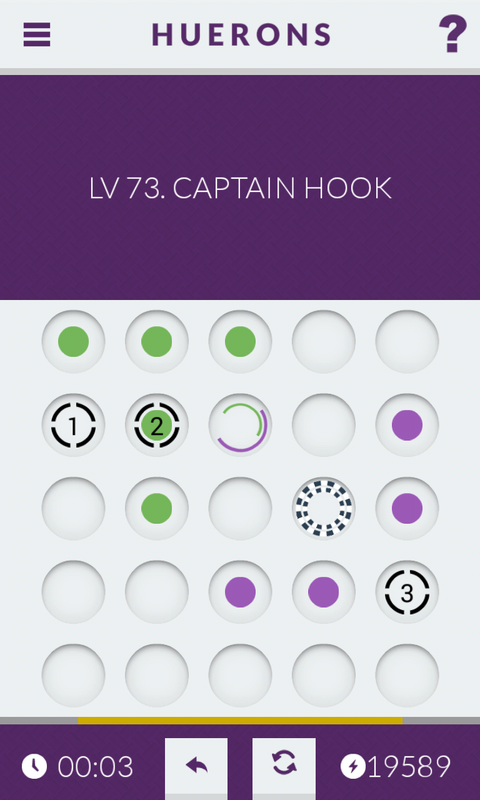 If you can't solve Level 73 Captain Hook on your own, just look at the picture above to see the correct solution. Huerons Level 73 Captain Hook Walkthrough, Cheats, Solution for Android, iPhone, iPad, iPod. Huerons Level 72 - I Found Nemo! Huerons is a original puzzle game, with unique gameplay, in which you have to link dots that have the same color, trough portals, black holes and other interesting things. 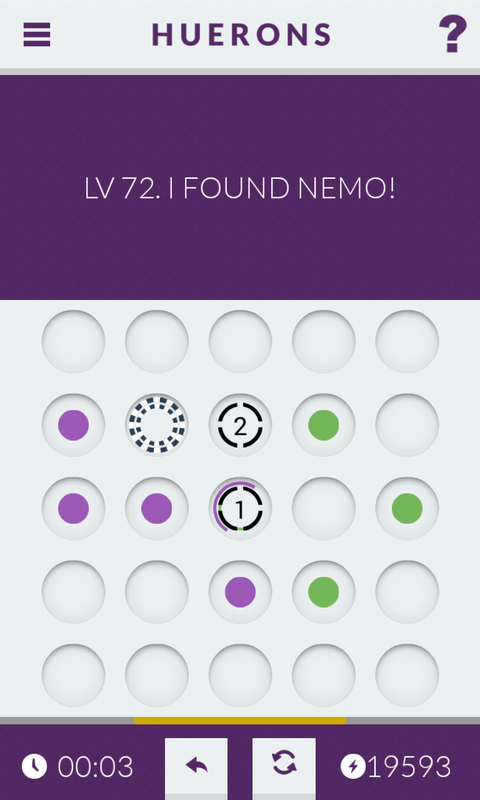 If you can't solve Level 72 I Found Nemo! on your own, just look at the picture above to see the correct solution. Huerons Level 72 I Found Nemo! Walkthrough, Cheats, Solution for Android, iPhone, iPad, iPod. Huerons is a original puzzle game, with unique gameplay, in which you have to link dots that have the same color, trough portals, black holes and other interesting things. 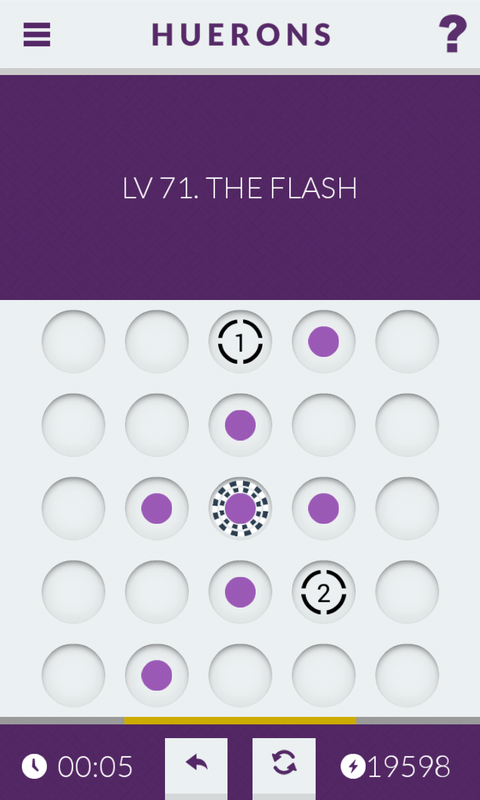 If you can't solve Level 71 The Flash on your own, just look at the picture above to see the correct solution. Huerons Level 71 The Flash Walkthrough, Cheats, Solution for Android, iPhone, iPad, iPod. Huerons is a original puzzle game, with unique gameplay, in which you have to link dots that have the same color, trough portals, black holes and other interesting things. 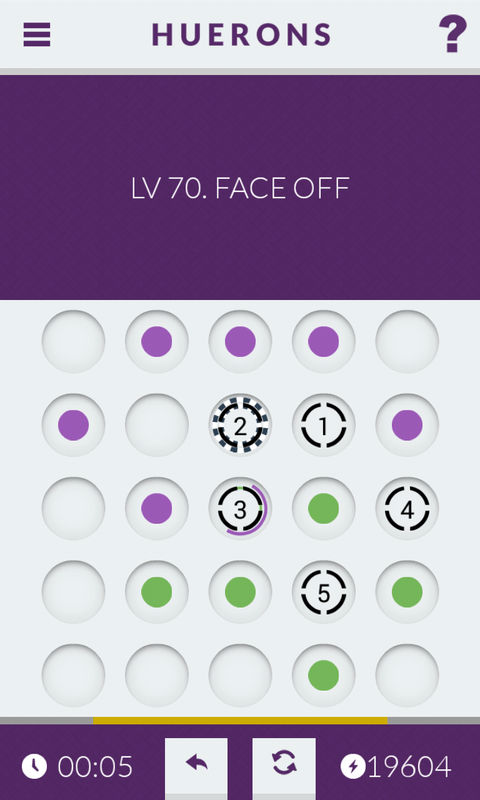 If you can't solve Level 70 Faceoff on your own, just look at the picture above to see the correct solution. Huerons Level 70 Faceoff Walkthrough, Cheats, Solution for Android, iPhone, iPad, iPod. Huerons is a original puzzle game, with unique gameplay, in which you have to link dots that have the same color, trough portals, black holes and other interesting things. 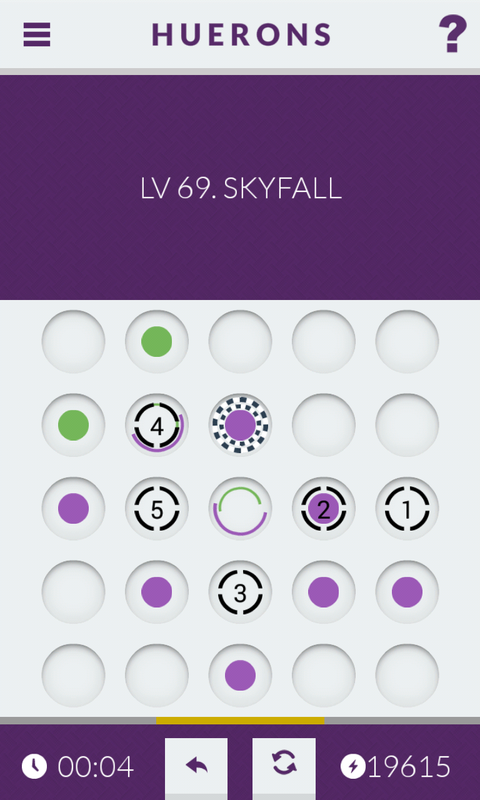 If you can't solve Level 69 Skyfall on your own, just look at the picture above to see the correct solution. Huerons Level 69 Skyfall Walkthrough, Cheats, Solution for Android, iPhone, iPad, iPod. Huerons is a original puzzle game, with unique gameplay, in which you have to link dots that have the same color, trough portals, black holes and other interesting things. 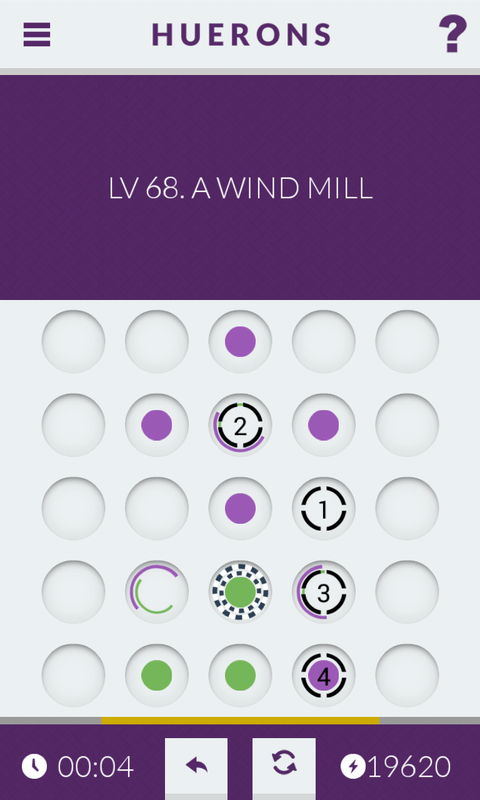 If you can't solve Level 68 A Wind Mill on your own, just look at the picture above to see the correct solution. Huerons Level 68 A Wind Mill Walkthrough, Cheats, Solution for Android, iPhone, iPad, iPod. Huerons is a original puzzle game, with unique gameplay, in which you have to link dots that have the same color, trough portals, black holes and other interesting things. If you can't solve Level 67 I Love Pi on your own, just look at the picture above to see the correct solution. 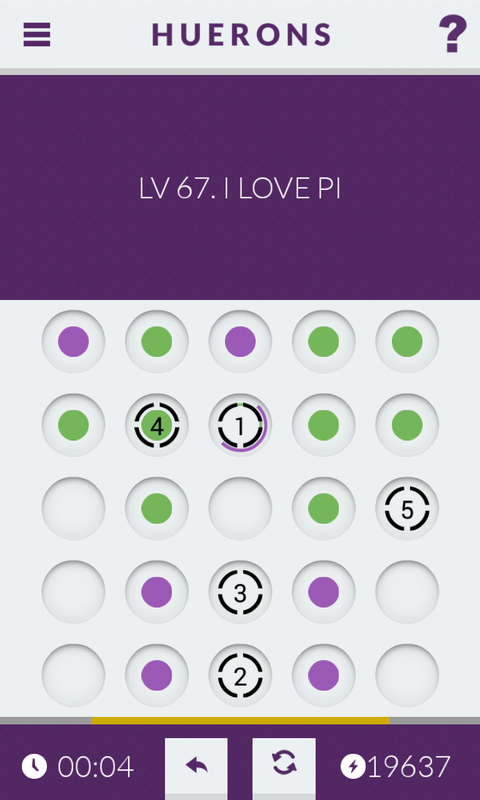 Huerons Level 67 I Love Pi Walkthrough, Cheats, Solution for Android, iPhone, iPad, iPod. Huerons is a original puzzle game, with unique gameplay, in which you have to link dots that have the same color, trough portals, black holes and other interesting things. If you can't solve Level 66 Infinite Eurekas on your own, just look at the picture above to see the correct solution. 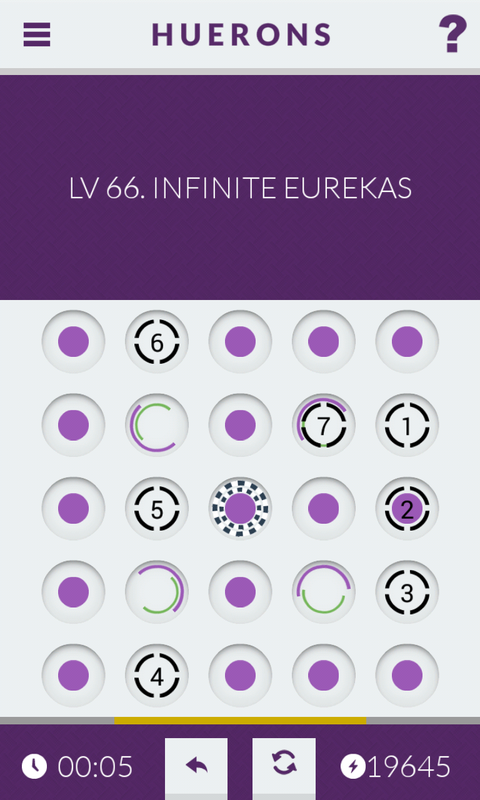 Huerons Level 66 Infinite Eurekas Walkthrough, Cheats, Solution for Android, iPhone, iPad, iPod. Huerons is a original puzzle game, with unique gameplay, in which you have to link dots that have the same color, trough portals, black holes and other interesting things. If you can't solve Level 65 You Shall Not Pass on your own, just look at the picture above to see the correct solution. Huerons Level 65 You Shall Not Pass Walkthrough, Cheats, Solution for Android, iPhone, iPad, iPod. Huerons is a original puzzle game, with unique gameplay, in which you have to link dots that have the same color, trough portals, black holes and other interesting things. If you can't solve Level 64 The Riddler on your own, just look at the picture above to see the correct solution. Huerons Level 64 The Riddler Walkthrough, Cheats, Solution for Android, iPhone, iPad, iPod. Huerons is a original puzzle game, with unique gameplay, in which you have to link dots that have the same color, trough portals, black holes and other interesting things. If you can't solve Level 63 Don't Block My Way on your own, just look at the picture above to see the correct solution. Huerons Level 63 Don't Block My Way Walkthrough, Cheats, Solution for Android, iPhone, iPad, iPod. 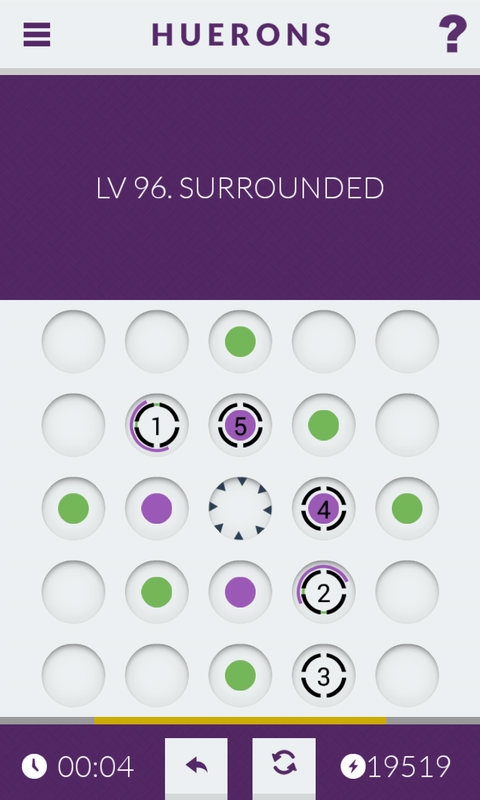 Huerons is a original puzzle game, with unique gameplay, in which you have to link dots that have the same color, trough portals, black holes and other interesting things. 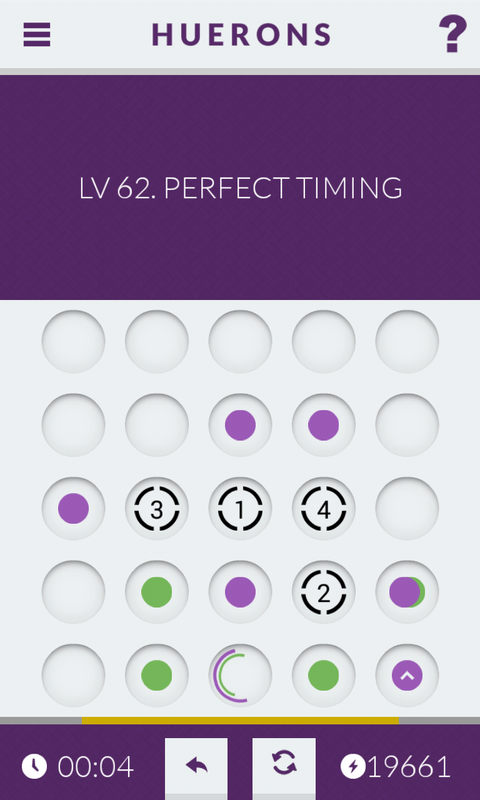 If you can't solve Level 62 Perfect Timing on your own, just look at the picture above to see the correct solution. Huerons Level 62 Perfect Timing Walkthrough, Cheats, Solution for Android, iPhone, iPad, iPod. Huerons is a original puzzle game, with unique gameplay, in which you have to link dots that have the same color, trough portals, black holes and other interesting things. If you can't solve Level 61 The Longest Drive on your own, just look at the picture above to see the correct solution. 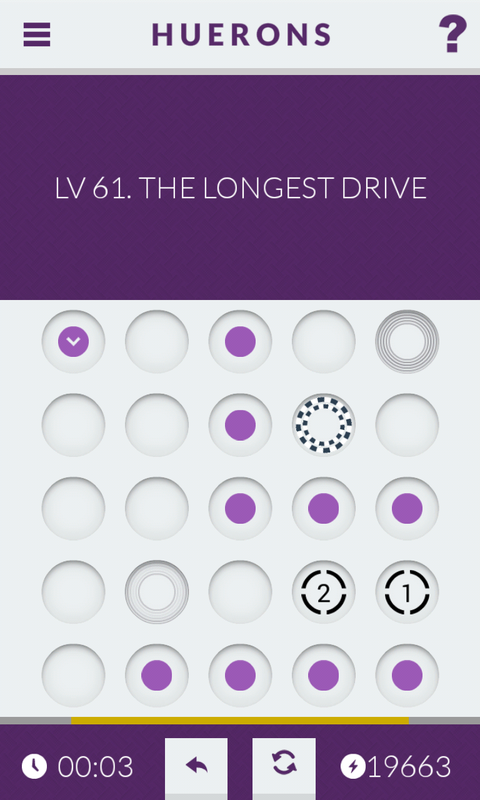 Huerons Level 61 The Longest Drive Walkthrough, Cheats, Solution for Android, iPhone, iPad, iPod. Huerons Level 60 - Castle! Huerons is a original puzzle game, with unique gameplay, in which you have to link dots that have the same color, trough portals, black holes and other interesting things. 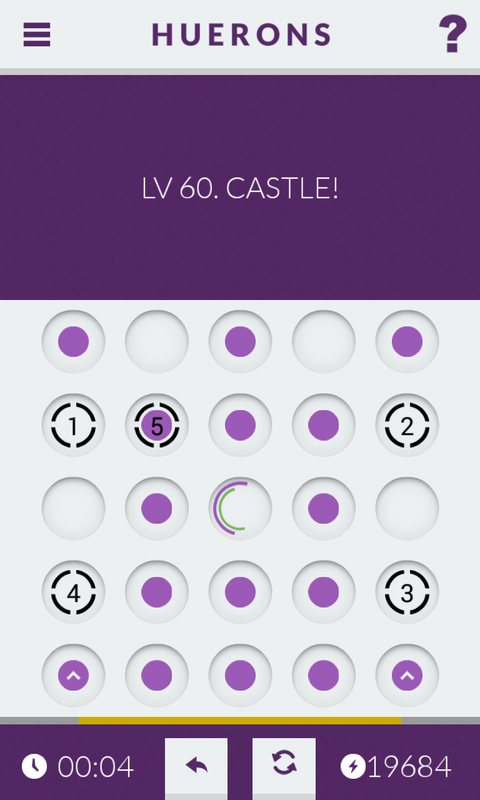 If you can't solve Level 60 Castle! on your own, just look at the picture above to see the correct solution. Huerons Level 60 Castle! Walkthrough, Cheats, Solution for Android, iPhone, iPad, iPod. Huerons Level 59 - Obstructed! Huerons is a original puzzle game, with unique gameplay, in which you have to link dots that have the same color, trough portals, black holes and other interesting things. 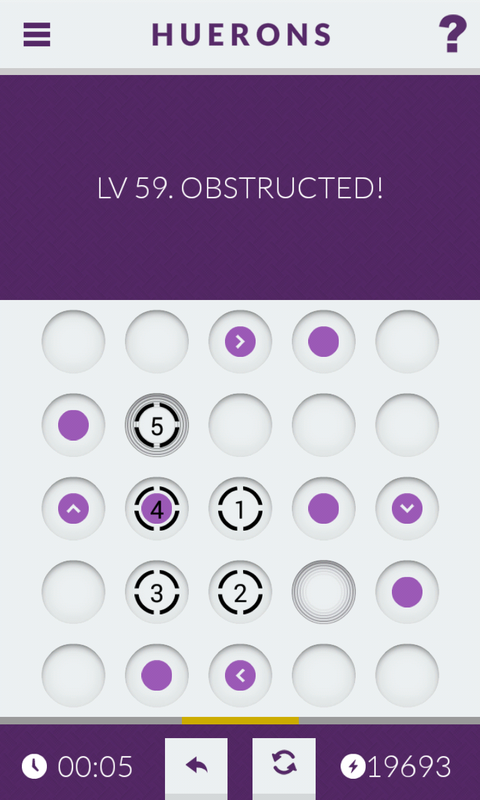 If you can't solve Level 59 Obstructed! on your own, just look at the picture above to see the correct solution. Huerons Level 59 Obstructed! Walkthrough, Cheats, Solution for Android, iPhone, iPad, iPod. Huerons Level 58 - Wait For Me! Huerons is a original puzzle game, with unique gameplay, in which you have to link dots that have the same color, trough portals, black holes and other interesting things. If you can't solve Level 58 Wait For Me! on your own, just look at the picture above to see the correct solution. Huerons Level 58 Wait For Me! Walkthrough, Cheats, Solution for Android, iPhone, iPad, iPod. Huerons is a original puzzle game, with unique gameplay, in which you have to link dots that have the same color, trough portals, black holes and other interesting things. 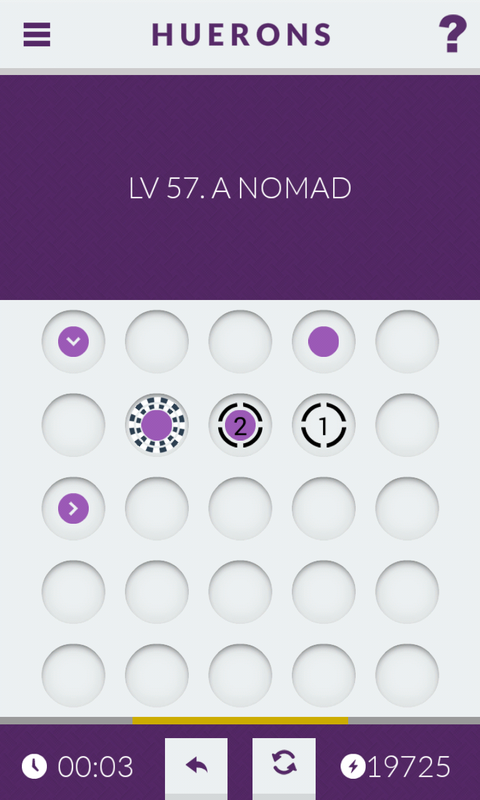 If you can't solve Level 57 A Nomad on your own, just look at the picture above to see the correct solution. 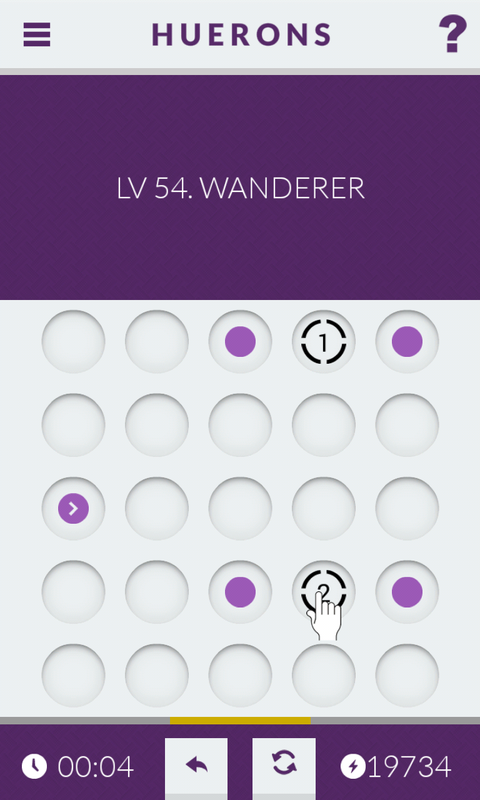 Huerons Level 57 A Nomad Walkthrough, Cheats, Solution for Android, iPhone, iPad, iPod. Huerons is a original puzzle game, with unique gameplay, in which you have to link dots that have the same color, trough portals, black holes and other interesting things. If you can't solve Level 56 Rain Drop on your own, just look at the picture above to see the correct solution. 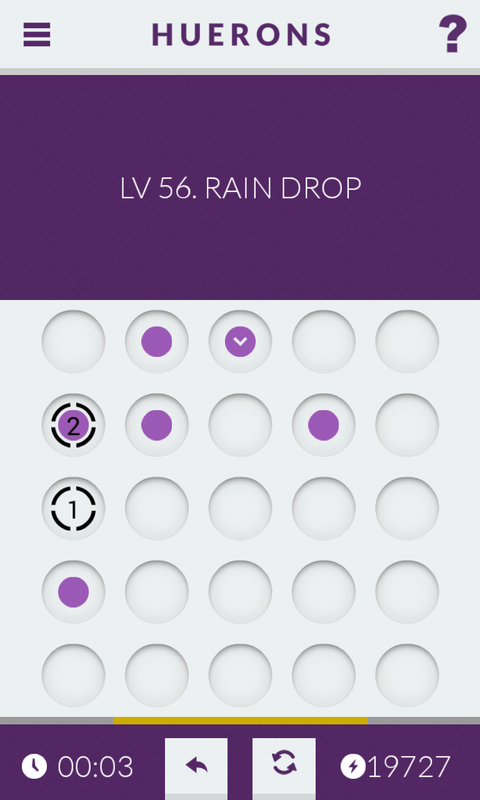 Huerons Level 56 Rain Drop Walkthrough, Cheats, Solution for Android, iPhone, iPad, iPod. Huerons Level 55 - Coming Trough! Huerons is a original puzzle game, with unique gameplay, in which you have to link dots that have the same color, trough portals, black holes and other interesting things. If you can't solve Level 55 Coming Trough! on your own, just look at the picture above to see the correct solution. Huerons Level 55 Coming Trough! Walkthrough, Cheats, Solution for Android, iPhone, iPad, iPod. Huerons is a original puzzle game, with unique gameplay, in which you have to link dots that have the same color, trough portals, black holes and other interesting things. If you can't solve Level 54 Collateral Damage on your own, just look at the picture above to see the correct solution. 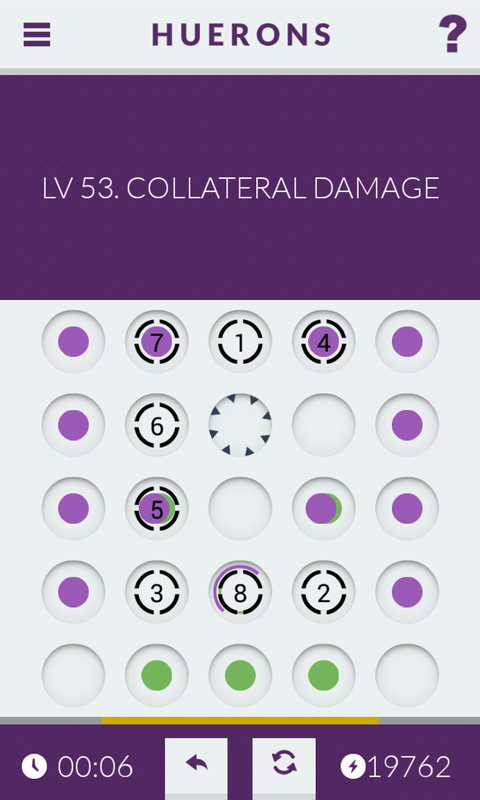 Huerons Level 54 Collateral Damage Walkthrough, Cheats, Solution for Android, iPhone, iPad, iPod. Huerons is a original puzzle game, with unique gameplay, in which you have to link dots that have the same color, trough portals, black holes and other interesting things. If you can't solve Level 53 Collateral Damage on your own, just look at the picture above to see the correct solution. Huerons Level 53 Collateral Damage Walkthrough, Cheats, Solution for Android, iPhone, iPad, iPod. Huerons is a original puzzle game, with unique gameplay, in which you have to link dots that have the same color, trough portals, black holes and other interesting things. If you can't solve Level 52 Deception - II on your own, just look at the picture above to see the correct solution. Huerons Level 52 Deception - II Walkthrough, Cheats, Solution for Android, iPhone, iPad, iPod. Huerons is a original puzzle game, with unique gameplay, in which you have to link dots that have the same color, trough portals, black holes and other interesting things. If you can't solve Level 51 Lego Blocks on your own, just look at the picture above to see the correct solution. 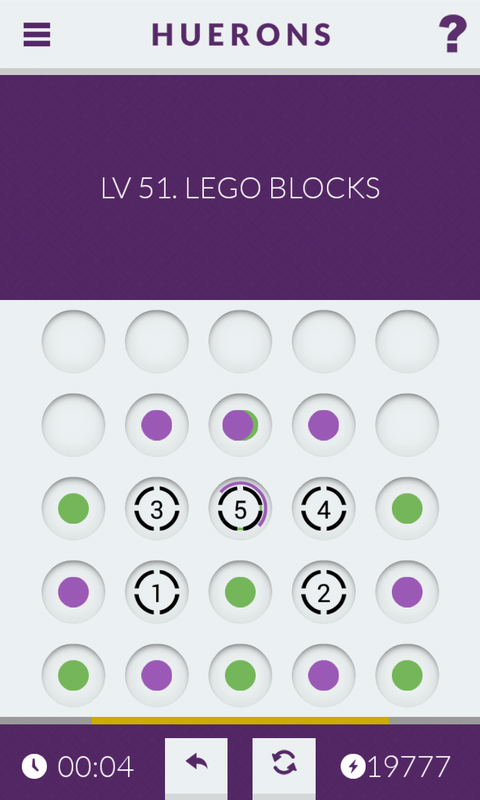 Huerons Level 51 Lego Blocks Walkthrough, Cheats, Solution for Android, iPhone, iPad, iPod.